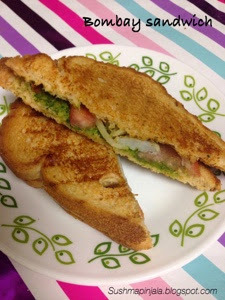 For day 3, my day started with a simple yet delicious Nasta- Bombay Sandwich. 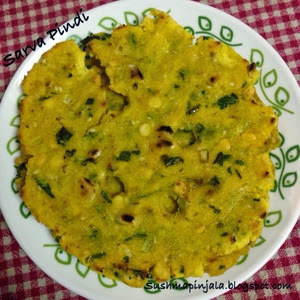 This is one of the simplest dishes to prepare for breakfast or mid day snack. Perfect to carry for picnic's and lunch lunch boxes too. This is one of the dish which is light yet filling. Mumbai or Bombay has been my Favorite city for long time. Couldn't spend much time there but loved the city, specially the Mumbai monsoon, shopping malls, food and of course I loved the local train journey. You might be thinking what this girl likes Mumbai crowded train journey? But yes I used to enjoy them. 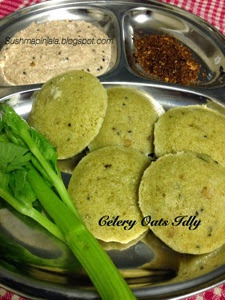 For day 2 under Nasta Time, am here with a healthy breakfast dish Celery and Oats idly. Celery is used around the world as a vegetable for the crisp petiole ( leaf stalk). The leaves are strongly flavoured and are used less often, either as a flavouring in soups and stews or as a dried herb. Celery is a staple in many soups specially chicken noodle soup.Celery is used in weight-loss diets where it provides low calorie dietary fibre. Eating celery provides positive net calories with digestion only consuming a small portion of the calories taken in. Oats are the species of cereal grain grown for its seeds. Oats have numerous uses in foods. Most commonly rolled or crushed into oatmeal or ground into fine oat flour. Also used in baked goods such as oatcakes, oatmeal cookies and oat bread. Today we are starting with the final week for BM # 48 and. And for this week my theme is "Nasta Time". Anything which can be had during morning breakfast or evening snack. Add all the ingredients in a large bowl except oil and mix well. For day 3 under Biryani's in different styles, am here with delicious Methi Chaman Biryani. 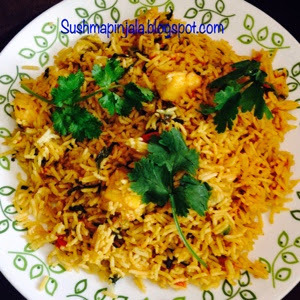 Flavorful biryani made with fenugreek leaves, paneer and some spices. When Srivalli announced the theme Biryani in different style, I thought of making Biryani with meat for all 3 days. I usually make biryani with Chicken, eggs, shrimp, goat and fish. Made biryani with mixed veggies too, but wanted to make something different this time. I had lots of Methi leaves at home and thought why not make some rice dish with these leaves. Paneer methi chaman curry is popular in Northern India. Came through this dish when I was looking for some Paneer dishes online. Then I googled to see why Paneer got its name as Chaman. Though I couldn't find proper info about this but got inspired to make Biryani with the methi leaves and paneer. For day 2, made simple and delicious Egg Biryani.Boiled Eggs are fried in ground paste made with cilantro, mint and green chilies with some spices. Then cooked in soaked long grain rice with onions, carrots and green peas. I added carrots and green peas jut to give some extra flavor and to look colorful. You can skip adding them if you do not want to. Wash rice and soak in water for 30 to 45 minutes. Boil eggs and keep aside to cool, then remove the shells. Coming to the 1st post for this year....Today we are starting with 48th Edition of Blogging Marathon. 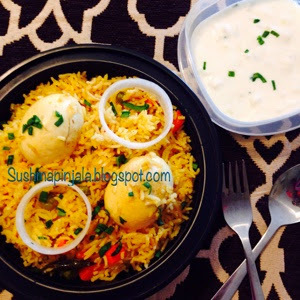 For the 2nd week, the theme I choose is "Biryani of different styles." 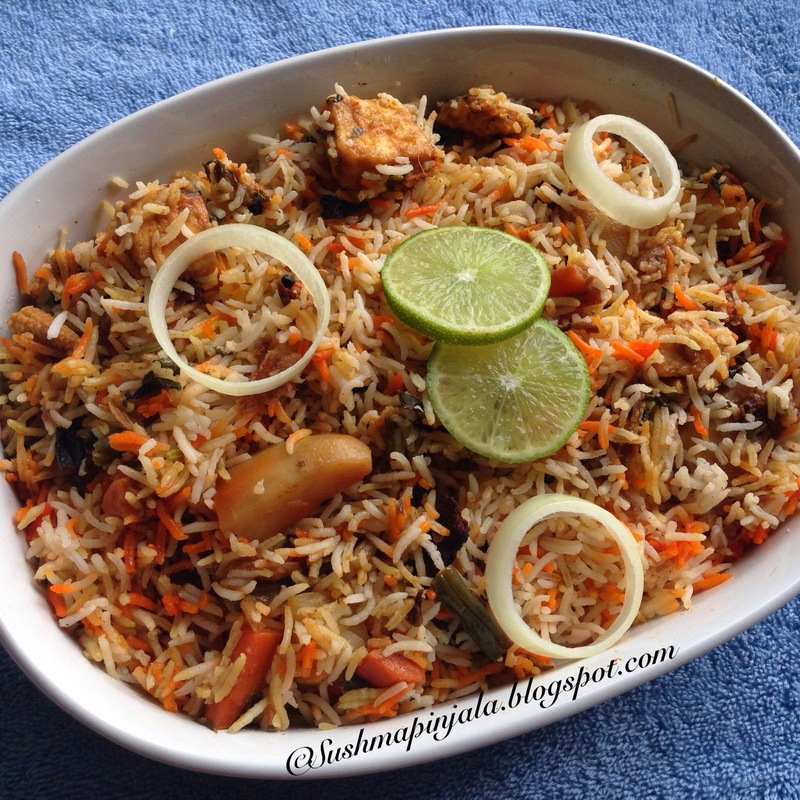 Biryani is a mixed rice dish from South Asia. Typically cooked with spices, rice, meat or vegetables. The word Biryani is derived from Persian language. The most common rice used to make biryani is long grain Basmati rice. The preparation may vary from region to region or cuisine to cuisine. One such popular cuisine is Hyderabadi Cuisine. Hyderabad is famous for its Hyderabadi Dum Biryani. Hyderabadi Biryani is originated after blending of Mughlai and Telugu Cuisine in the kitchens of the Nizam rulers of the historic Hyderabad state.